ROBERT LAURENCE BABER is Professor Emeritus in the Department of Computing and Software at McMaster University, Canada. A Fellow of the BCS, The Chartered Institute for IT, he has published numerous journal articles in his areas of research interest, which include mathematical modeling and the conception, planning, and design of computer-based systems for technical and business applications. 2. Preview: Some Statements in English and the Language of Mathematics. Part B. Mathematics and its language. 3. Elements of the Language of Mathematics. 4. 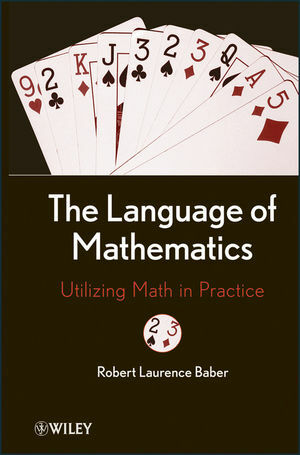 Important Structures and Concepts in the Language of Mathematics. Part C. English, the Language of Mathematics and translating between them. 6. Linguistic Characteristics of English and the Language of Mathematics. 7. Translating English to Mathematics. 8. Examples of Translating English to Mathematics. Appendix B. Symbols on the Language of Mathematics. Appendix C. Sets of numbers. Appendix D. Special structures in mathematics. Appendix F. Waves and the wave equation. Appendix G. Glossary: English to the Language of Mathematics. Appendix H. Programming languages and the Language of Mathematics.